Patriots’ Day – Patrick F. Clarkin, Ph.D.
No more hurting people. (Martin Richard). I’m at a loss as to how to properly address yesterday’s tragedy here in Boston, on Patriots’ Day. Following the attacks at the marathon and a nearby scare for our neighbors at the JFK Library, our university was closed yesterday afternoon and for most of the day today as a precaution. I’ve been wondering how, as teachers, we’ll get back to normal so soon after the event. Do we ignore it, and go on as if nothing happened, or address it head on? I don’t know, and will probably make some gut decision during tomorrow’s morning commute. I can guess how provincial these musings seem. They are routine now: we are all Bostonians, or Americans, or Hokies, or Haitians, or Pakistanis, or Laotians. Tragedies happen daily around the world, some by accident, some by malice. Ideally we should view all of them with equal sadness. But in reality it is the local ones that strike us the hardest. We cannot love all seven billion people equally, however idealistic we may be. Universal love is, if not impossible, at least very, very difficult. Empathy is most easily extended to people who remind us of ourselves, who travel the same streets and subways, and share our accents and favorite sports teams. But we can do better. We often overcome barriers of ideology, age, language, or physical appearance, recognizing the similarities we share with others. Matt Ridley once wrote that “similarity is the shadow of difference.” Both exist simultaneously, but the one that resides forefront in our consciousness is a matter of focus. At the level of the very small, we can empathize with other individuals by focusing on the similarities (it doesn’t take much, unless you are a psychopath). But when groups view other groups in some abstract sense, as a barrier, or as a monolithic enemy, or a means to an end, then empathy evaporates. That doesn’t seem to take much either, tragically. Wherever we derive meaning — religion, friendship, family, science — I think we can all agree that life is already inherently fragile and painful enough. We don’t need the added burdens caused by people recklessly injecting their hatred, uninvited, into the lives of others. I would hope that whenever someone gets the urge to think that their views are so righteous that they justify killing other innocent people, then that would be the perfect time to take a serious, long look in the mirror and ask themselves how they got so far off course. Though I know how frequently that hope will be met by disappointment. Many times on this blog, I’ve described life in a biological sense, as being the pursuit of genetic continuation. We’re born, grow up, then get a chance to pass on our genes (or not) only to start the cycle over again, indefinitely. To some people, that is a cold, materialistic view. But I see it differently. I think it is a beautiful perspective, knowing that we have an ancient chain of ancestors – with an almost countless number of links – standing behind us. To me, this perspective underscores how ephemeral each individual life is and how incalculably minute were the odds against any of us from being here today. In the case of the Patriots’ Day bombings, I cannot help but get infuriated over someone violating another person’s right to simply live. Death is not the issue, because death is unavoidable for all of us (sorry, but it’s true). The issue is injustice. Intentionally stealing someone else’s time to exist is abhorrent because it is irreparable. We can restore confidence, fix buildings, mend wounds, and repair city streets and businesses. But, once lost, you cannot get a life back. Nobody has the right to take that away, especially not from the very young and innocent. And certainly not for some flawed, stained political ideology. This entry was posted in Altruism, Life and tagged Boston, Marathon, Patriots' Day. Bookmark the permalink. Patrick, A very nice article with a few typo’s here and there. Considering the magnitude of the event in Boston yesterday, I have already cut you some slack. You will learn in time that releasing the event from your mind will grow more meaning in you heart and you will find the answer to the inigma you write about much easier. I find hope in that one day I will read where you cut you grass with a push reel lawnmower with a flashlight taped to the handle by electrical tape. Thanks for the slack. I found a couple of typos and corrected them. I do like your idea that with age comes wisdom and meaning. I’m looking forward to that (hopefully). As I get older and closer to death I am becoming more philosophical, for lack of a better word, and simultaneously more compassionate. Death is really not a big deal. It’s like turning out all the lights, going to sleep or going under anesthesia and not waking up, or reading “The End” on the last page of a novel. I can say this because I’ve been very close to death a few times and it has lost its terror. I’m far more scared of a disabling injury, and hope that I would still have sufficient awareness and mobility to terminate my own life. To me that is the real tragedy of the Boston bombing. Many of the hundreds injured, mentally as well as physically, will no longer be able to live life abundantly. War does this to people. But even in the wake of this tragedy, I see no signs of increased compassion in the West for the victims of bombings that daily kill ten times as many in other countries. Nine hundred people or more died in the Bangladesh building collapse and in America, the story didn’t even make the front pages. This is the mentality that allows wars to happen. You make several good points. I’ve often wondered how I’d respond emotionally to a major injury. It certainly wouldn’t be easy, and I empathize with anyone having to go through it. I can rationalize to myself that all life is on borrowed time, so we should cling to it even if we are not in our prime form (and we’re never in prime form anyway). But that’s the rational part of me. The deeper emotions of despair can be hard to fight back with philosophy. On the other hand, we can “rage against the dying of the light.” Rage is another powerful emotion to counter despair, but that’s also likely involved in war as well. I wrote this a year ago, when my thoughts were still raw and fresh after the Boston Marathon bombings. 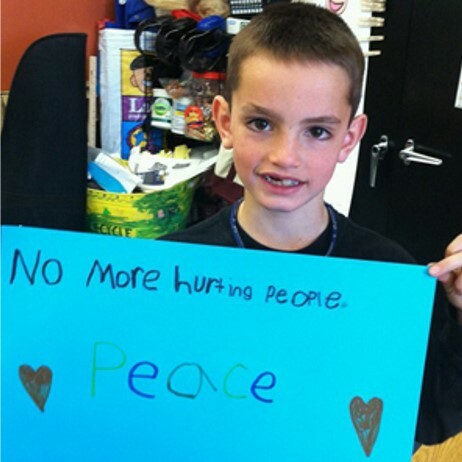 I recently added the photo of Martin Richard, who was tragically killed that day. All unjust deaths are tragedies, but a child who asked for peace just seems so much worse. I feel for his family, and anyone who’s lost someone close to them. I often think about, and find inspiration from, this photo of an 8 year-old boy showing wisdom that often eludes adults: Just don’t hurt anybody. That’s about as fundamental as it gets. But tragedies are not in short supply: the shootings in Kansas, the Crimea, Syria, the Central African Republic, and on and on it goes.